As the only golf course in Ireland to have staged the Open Championship, Royal Portrush is held in high regard on the Emerald Isle. Rightly so, because the stunning seaside gem is consistently ranked within the world's top 20 tracks. Portrush is a venue rich in championship heritage, as a home course to both Darren Clarke and Graeme McDowell, those playing here are sure to be tested to the very best of their game. In 2019, Royal Portrush will host the Open Championship for the second time as the 5 year cycle of it returning to St Andrew's is broken in order to enable the Old Course to host the 150th open Championship in 2020. Portrush is sure to be feature on any golf fanatic's bucket list and ticking it off has never been easier with Your Golf Travel. Bordered by the towering dunes that typify the shoreline of County Antrim, the golf course was originally conceived and realised in 1888, but the championship layout in its present state owes thanks to the 1947 redesign completed by Harry S. Colt. The renowned course architect has a stupendous track record throughout the United Kingdom, and Portrush is no exception. 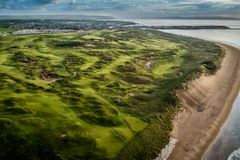 While it may not be the longest championship golf course, Royal Portrush is predicated on the fundamental essence of links golf; totally exposed to the elements, the course's character is heavily dependent on the local conditions, and can change in a heartbeat. The R&A, and rightly so, are extremely particular about the Open Championship rotation, and Royal Portrush's 1951 award is indicative of its incredible character - any serious golfer heading to Northern Ireland would be remiss to overlook this golf tour gem. In 2014, the Dunluce Links course hosted the very best of the amateur game with the 119th Amateur Championship. The field was reduced to 64 plus ties on a qualifying mark of +4 after rounds at Portstewart and Royal Portrush with Daniel Brown of Bedale Golf Club, Yorkshire taking medallist honours by 4 shots with a -8 total. Despite finishing in a tie for 35th in qualifying, Bradley Neil of Blairgowrie Golf Club managed to secure the Championship with a 2&1 victory over Zander Lombard from South Africa. The final was a very close affair with Zander's bogies on 10 and 11 creating a 2 hole margin which he was unable to overturn. Dunluce's 411 yard 5th hole is something of a masterpiece, with the elevated tee providing an opportunity to take in the wondrous seaside links course. The hole itself is nothing short of extraordinary either, and provides the golfer with excellent risk-reward golf. However, whether you land on the green or not, you are sure to appreciate the stunning views towards the Dunluce Castle. A magnificent golf hole, and if you didn't know risk-reward golf before you definitely will now! Located on the lower ground along the Causeway Coast, the Valley Course might not share the same elevated views of the Dunluce Course but it is of equal interest and challenge. Measuring just over 6,300 yards against a par of 70, this Harry Colt layout enjoys many of the same characteristics of it's 3-year older brother Dunluce with undulating fairways with well protected greens. A favourite amongst visitors and guests alike is the driveable par-4 5th hole, with dunes surrounding the green it provides a fantastic amphitheatre look and feel with any drives getting close to the putting surface feeling like a real grandstand effort. Valley's signature hole plays as a 237 yard par 3 to a well protected green surrounded by mounds. Anywhere left is dangerous, as a bunker is situated front left as well as a steep drop off further out. A thought provoking hole and an obscured view of the green means that this par 3 requires a confident shot! Outstanding course.why would anyone pay £200 plus to play the championship course next door when this is available for £32 and is practically identical.